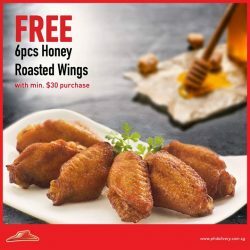 Till 30 Dec 2018 Pizza Hut: Enjoy 10 Pieces of Honey Roasted Wings for just $1 & 20% OFF Total Takeaway Bill! With the festive season in full swing, ease the stress with Pizza Hut's exclusive delivery & takeaway deals! Enjoy 10 pieces of honey roasted wings for just $1*, when you place an advance order! Need a last minute pick-me-up? 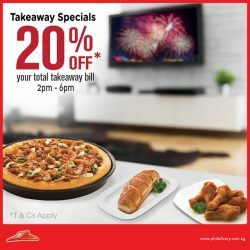 Head down to any Pizza Hut stores from 2pm to 5pm on 22-25 Dec, 29-31 Dec, 1 Jan to enjoy 20% off* your total takeaway bill! 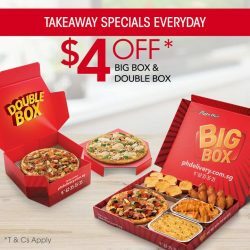 Till 19 Aug 2018 Pizza Hut: Flash This Post to Get $7 OFF Any Cheesy 7 Pizza or Use Coupon Code for Delivery or Takeaway! Here’s one more reason to satisfy your cheese cravings today! 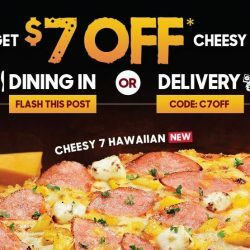 Enjoy $7 OFF any Cheesy 7 Pizza at Pizza Hut! Simply flash this post to their friendly staff when you dine at Pizza Hut, or use the code for delivery or takeaway orders via website/app. Offer is valid till 19th August 2018. 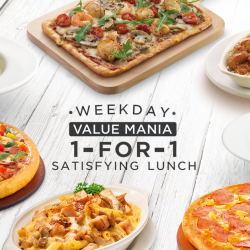 Pizza Hut: Enjoy 1-for-1 Mains All Day Every Weekday! 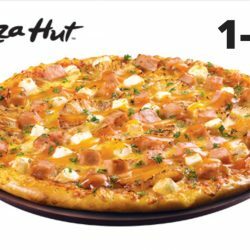 Till 22 Jun 2018 Pizza Hut: Enjoy 1-for-1 Mains on Weekdays! Jazz up your weekdays from 11am - 5pm, with Pizza Hut's 1-For-1 mains deal  Savour your favourite pizzas and yummy entree today. Don't miss out on this limited time special! T & Cs Apply. 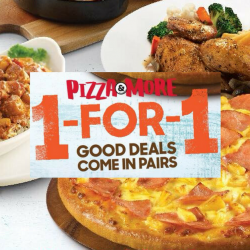 Enjoy $1 large pan pizza for delivery via website/app with min. $25 spent when you checkout with Masterpass! Valid till 22 June 2018. Good things are meant to be shared. 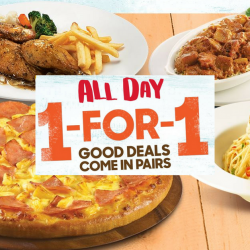  Head down with your buddies to Pizza Hut restaurants and enjoy 1-For-1 Mains. Wide range of pizzas, pastas or entrees for you to pick from. Don’t miss this limited time special! T&Cs apply. For a limited time only! 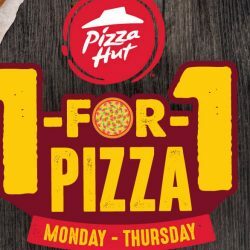 Pizza Hut: Enjoy 1-for-1 Pizza from Monday to Thursday for Delivery! How about ordering pizza delivery for lunch today? 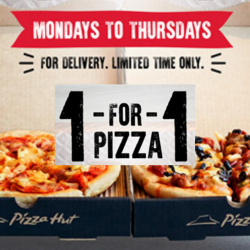 Enjoy 1-for-1 pizza from Monday to Thursday when you order Pizza Hut delivery! Valid for a limited time only. If you're in the mood for some cheesy goodness, Pizza Hut is the place to be. Make use of this $50 cash voucher to enjoy some of your favourite Italian delights! Bite into a slice of Pizza Hut's signature Hawaiian Pizza or grab yourself some irresistible Sweet 'N' Spicy Drumlets. If you prefer to take a healthier route with salads made from the freshest garden greens, or our Hand Stretched Thin Crust pizzas that won't wreck your diet plans. Alternatively, choose their chef's recommended Chicken a la King Stew and an array of desserts to complete your meal. Introducing the NEW Pizza Hut app! It's now easier than ever to order with app-exclusive coupons, self-collect options and easy 3-click re-ordering. Download the app today to snag a $1 Regular Pizza coupon for yourself! 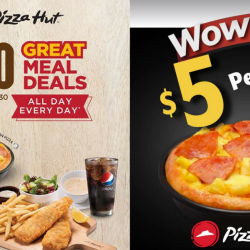 Pizza Hut: Great Meal Deals from Just $8.90 & Takeaway Pizzas from Only $5! Tempted to grab a bite? Now you can enjoy great food with Pizza Hut's all new Great Meal Deals that’s available all day, every day! Starting from just $8.90, each set comes with a wide range of Mains to choose from, along with an option of Soup of the Day or Mini Salad and a glass of soft drink. For takeaway, enjoy pizzas from only $5! 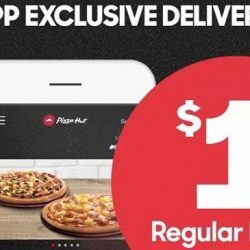 Till 7 Nov 2017 Pizza Hut: Enjoy S$3 Large Classic Pan or Hand Stretched Thin Pizza with OCBC Cards for Delivery! Large Classic Pan or Hand Stretched Thin Pizza for only S$3?! You can enjoy this offer with just a min. 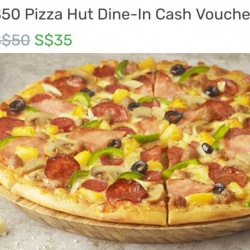 spend of $25 on Pizza Hut delivery using OCBC cards! Remember to use the below coupon code before selecting your choice of pizza! Valid till 7 November 2017. Exclusively for NTUC members, enjoy 1-for-1 Specialty Pizza at Pizza Hut on weekdays from 19 July to 31 December 2017! Valid for dine-in only. Present NTUC Card before ordering to enjoy the privilege! Till 28 Apr 2017 Pizza Hut: All-You-Can-Eat Pizza Buffet Fiesta with Free Flow slices of Pizzas, Breadsticks, Soup of the Day & Soft Drink! 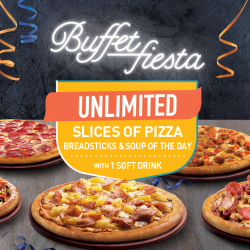 Pizza Hut's All-You-Can-Eat Pizza Buffet Fiesta is back! Enjoy free flow slices of your all-time favourite Pizzas, Breadsticks, Soup of the Day and 1 free Soft Drink in a 90-minute ultimate Pizza Feast! 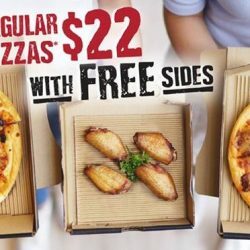 Limited time only Pizza Hut: Enjoy 2 Regular Pizzas for $22 & Get FREE 4pcs Side of Your Choice! 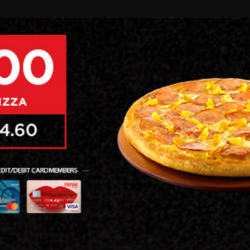 Up your savings goal with Pizza Hut! 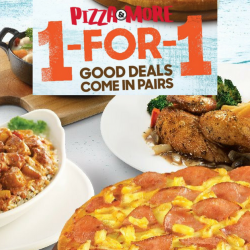 Get a FREE 4pcs side of your choice, when you go 2-For-$22 on their regular Favorites range pizzas for delivery! 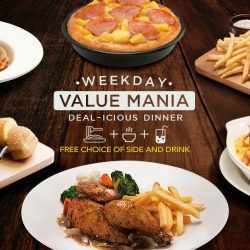 Pizza Hut: Enjoy FREE 1 x Side & Drink with Every Order of Selected Mains on Weekdays! Enjoy FREE 1 x Side & Drink with every order of these deal-icious dinner meals starting from as low as $9.50! Be spoilt for choice with a selection of over 20 pizza flavours and 24 varieties of pastas & entrées! 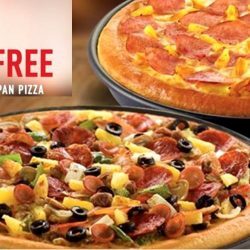 5 Jan 2017 Pizza Hut: Pizza Buffet – Free Flow of Pizza at only $8.80++ Per Person! Pizza Hut's legendary pizza buffet is back! If you are a big fan of their Classic range of pizzas (Hawaiian, Meat Galore and Curry Chicken etc) then this is one event not to be missed. 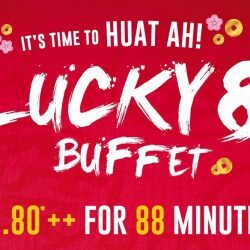 For just $8.80++ per person, you get to enjoy free flow of pizzas for 88 minutes. What's more, you will also get to enjoy the new Fortune Shrimp Bite Pizza when you participate in this event. Limited to 88 pax per session on 5 January so hurry and chope a seat for yourself now! 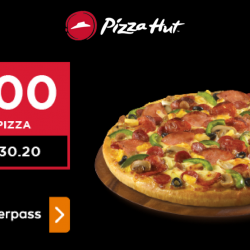 Buy 1 Regular Classic Pizza and get the second one absolutely FREE at Pizza Hut! Yes, you heard us right. Hurry, it’s for a limited time only, till 31st Aug 2016! *T&Cs Apply. Pizzas, Pastas, Entrees and Baked Rice - a variety of tasty choices to choose from to keep you coming back for more! 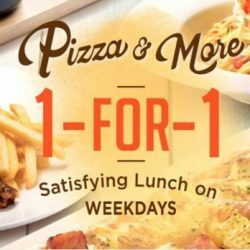 Call along a lunch kaki to enjoy this special deal of 1-for-1 deals on weekdays from 11am to 5pm! For a limited time only. Enjoy the National Day Parade with a hearty Pizza Feast! Get 20% off your Takeaway Bill on 9th Aug, 2 – 6PM. Available at selected outlets http://bit.ly/2ay6VKB. Pre-order now. T&Cs Apply. 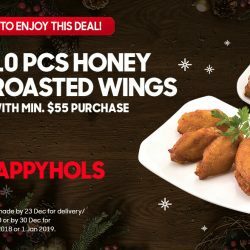 6pcs of tender wings well marinated in honey comes FREE with a minimum delivery order of $30. Order now and grab this great deal today: bit.ly/PHHotDeals T&Cs apply. Enjoy $4 off your Double Box & Big Box orders when you grab a takeaway from delivery outlets or place a self-collection order online using the coupon codes below. Valid till 2 Aug 2016. T & Cs applies.